Aquatics is the job for Arron, clearly! Posted on December 15, 2017 at 9:19 am. 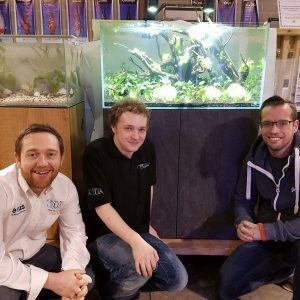 Arron is 25 years old and works for Clearly Aquatics in Bangor as an Aquatics Consultant. He had several work experiences before securing his full-time position, starting off as an apprentice with the company before securing his consultant post. Arron approached Orchardville in 2012 as he wanted support to develop his skills and further his career. It was also important for Arron that his employer was supported to better understand Asperger’s Syndrome and how it can affect his daily life. Support was therefore aimed at developing Arron’s communication skills, confidence, professional relationships in the workplace and establishing a more healthy work / life balance. In 2014 Arron expressed an interest in expanding his work experience and branching out into another vocational area. With the help of his Workable (NI) Employment Officer Arron created a CV and applied for a temporary position as a Clerical Assistant in Queen’s University. Arron secured employment with Queen’s and worked hard throughout the year of his temporary post. The support and frequent mentor sessions with his Employment Officer helped Arron develop his skills in organisation, prioritising, meeting deadlines and improved his communication. His confidence also grew in this time and he became more aware of his ability and strengths. Throughout this time Arron continued to develop his knowledge in relation to aquatics and their living conditions. He is currently one of the top performing consultants in the company and has developed strong relationships with customers, who often return to the store due to the support and expert guidance provided by him. If you would like more information on how Workable (NI) can help you as an employee, or your employer please contact us.